PLEASE FOLLOW THIS LINK FOR ALL PARK DOCUMENTS PRIOR TO BIDDING https://drive.google.com/folderview?id=0B0q9NDLIOYUNMWxpR2l2V3VPVnM&usp=sharing A Beautiful Resort, In “Old Tyme Florida” Tavares, Florida. 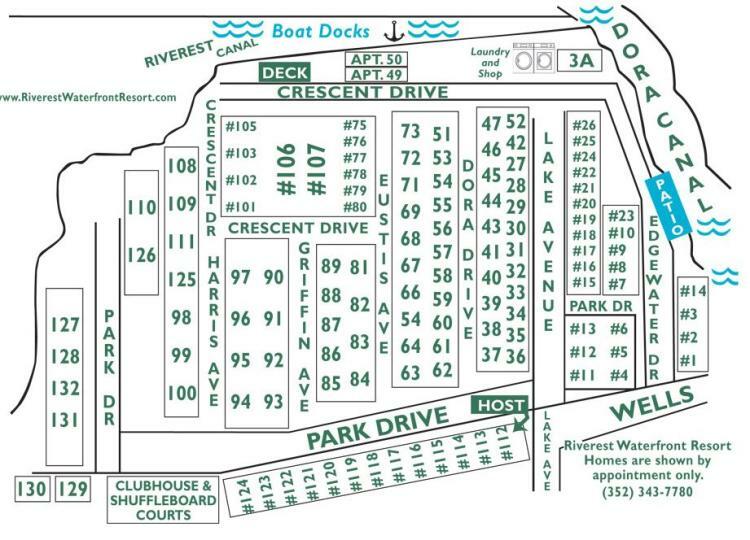 Riverest Waterfront Resort offers homes for a warm winter in Tavares FL, at affordable prices and with the peaceful setting along the Dora Canal, which connects to the Harris Chain of Lakes where wintertime fishing and boating can be an everyday lifestyle. We have a relaxed and quiet atmosphere with water on two sides; nature surrounds us! Riverest Waterfront Resort is located in Central Florida in the quaint & historic town of Tavares, which is a deep south setting, yet minutes away from beautiful Mount Dora and Leesburg. We have many Orlando area attractions and beautiful Florida beaches within an hour’s drive. Tavares is the Seaplane Capitol of Florida. Tavares has many festivals and events that take place year round. In addition to Seaplane events, we have Jet Ski competitions, bass tournaments, antique boat and car shows, and food festivals. A “must-see” is to take a ride on the historic Orange Blossom Cannonball, which is a 1907 steam locomotive train. It goes by many places, including our very own Riverest Waterfront Resort.